BrandpointContent - What's making noise in your attic? Was that a squeak you just heard? A thump? What could possibly be making those noises inside your house, and what can you do to help get rid of whatever pest has decided to move in? The experts at Terminix have some information on what might be going bump in your attic. Chirping or flapping coming from your attic area indicates that a bird (or two) may have decided to make a home up there. If your attic area has high ceilings or open beams, birds will have ample room to fly around, perch and maybe even roost or nest. Baby birds hatching in your upstairs might sound cute, but you probably don’t want to deal with unsanitary bird droppings all over your attic. If you hear scratching, gnawing, scurrying or squeaking noises coming from your attic, you could have a rat or mouse infestation. These rodents can find their way into your home through a variety of entry points; anything from a roof vent to a poorly sealed window frame can provide access to your attic and the rest of your home. Mice in particular are excellent climbers, and roof rats — a type of rat — have been known to enter houses by accessing the roof via climbing on tree branches or nearby vines. You might think that tiny hole in your attic wall is too small for any pest to fit through. Think again. Bats, which can weigh less than two ounces, can fit through a hole as small as the diameter of your finger! Some species like to nest in trees, which means they could be attracted to the wood framing in your attic. Since these critters can carry rabies and other disease-causing pathogens, don’t try to remove the pest yourself. If you think bats might have made their way into your attic, contact a professional. 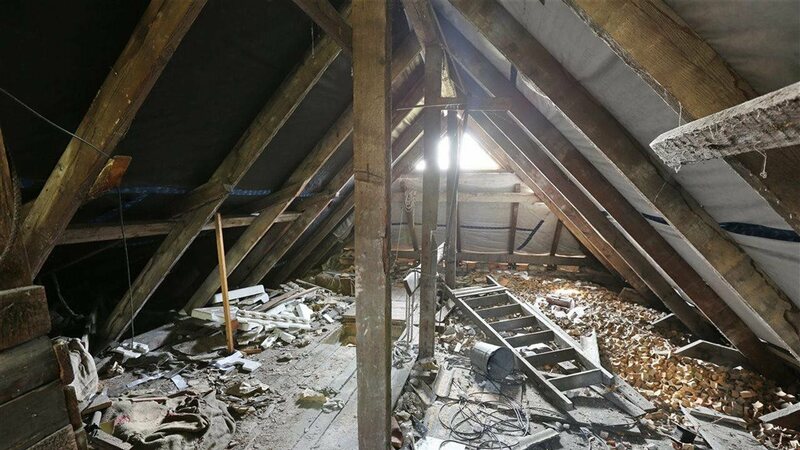 Rustling and other noises coming from your attic could hint at a lot of different critters. But if you’re hearing those noises during the day, that’s a hint that squirrels, which are diurnal, could be causing the ruckus. These animals are persistent and can damage the exterior of your home. They’re also easily excited and can cause more damage when they feel cornered, so don’t try to take one on yourself. You shouldn’t have to deal with a pest infestation alone, particularly as a busy homeowner with a long list of other tasks to tackle. Leave the critters in your attic to trained professionals, such as Terminix’s trained technicians, who can help determine the type of pest that has taken up residence in your attic and come up with a customized treatment plan. Was that a squeak you just heard? A thump? What could be making those noises inside your house, and how can you get rid of whatever pest has moved in? The experts at Terminix have information on what might be going bump in your attic. Birds: Chirping or flapping indicates a bird (or two) may have decided to make a home up there. Rats and mice: If you hear scratching, gnawing, scurrying or squeaking, you could have a rat or mouse infestation. Bats: Bats, which can weigh less than two ounces, can fit through a hole as small as the diameter of your finger! Squirrels: Rustling and other noises during the day hint that squirrels, which are diurnal, could be causing the ruckus. Leave the attic critters to professionals, such as Terminix’s trained technicians, who can help determine the type of pest and come up with a customized treatment plan.